Get 50% off shorts and tees and save an extra 40% off sale styles at LOFT. Since no code is needed you can use code INSIDER442 for an additional $25 off qualifying full-price promotional purchases of $100+ (excludes Lou & Grey). This insider code is valid through June 10, 2018. Yesterday I ordered this flamingo pocket shell and this floral embroidered sweater (review of size XS regular here) in size XS petite with free shipping in store after I did some returns. 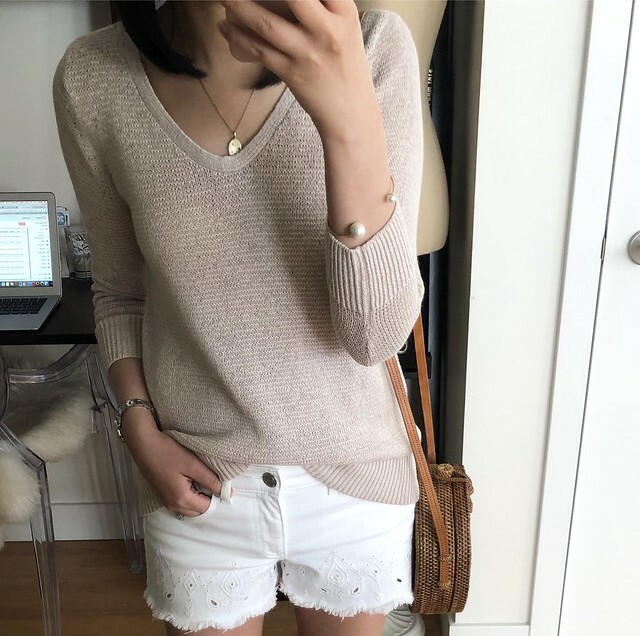 I love this neutral look for the spring and summer. Yesterday I wore this Ellen & James round natural bag out with one of my older polyester dresses but it completely snagged and shredded the side of my dress as seen here. I wouldn’t recommend this bag since it can ruin your more delicate clothes. I hope I can return the bag and I’m disappointed that I have to keep look for another round bag. Also the winners of the Instagram giveaway for 3 $100 LOFT e-gift cards have been announced in this post. Thanks so much for those who entered! It was my first giveaway with other blogger friends. If I were to do another giveaway would you prefer if I did it myself versus with others? I tried on these shorts in store yesterday but these shorts run about one size bigger. I probably need them in size 0P but the pocket lining is see through and the material may be prone to looking wrinkly when you sit down and get up. 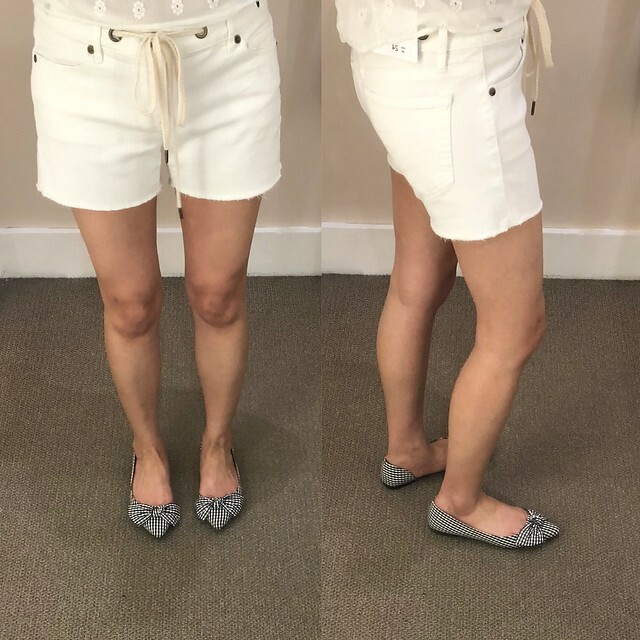 They fit similar to the crosshatch ruffle shorts I reviewed in this post but these have a longer inseam. These rope tie shorts are really cute and they run true to size. The leg opening isn’t too wide so they look okay with my thin thighs. I was deciding between this pair and the eyelet pair featured at the top of this post so for now I only got the eyelet pair. Can you tell I have a thing for white shorts? Ha. I’m working on a new, longer blog post and I really appreciate your patience. Last week I was wrapping up things for work (things always seem to be crazy busy before vacation) so I never got around to doing a more detailed post with all of my recent fitting room try-ons. I hope we all see a decent Memorial Day sale tomorrow for LOFT! Fingers crossed.